Donald Trump is still going after Ford. The Republican nominee reaffirmed his plans to slap a 35% tax on Ford's cars made in Mexico and sold in the United States. "When that [Ford] car comes back across the border into our country that now comes in free, we're gonna charge them a 35% tax. And you know what's gonna happen, they're never going to leave," Trump told Fox on Thursday morning. That would spell bad news for Ford, which announced Wednesday that it would move all production of its small cars to Mexico in the next two years. Ford's spokesperson says the production shift won't result in any U.S. job losses. Ford already has a big footprint in Mexico. It employs 8,800 employees there. In the U.S., Ford employs 85,000 people. 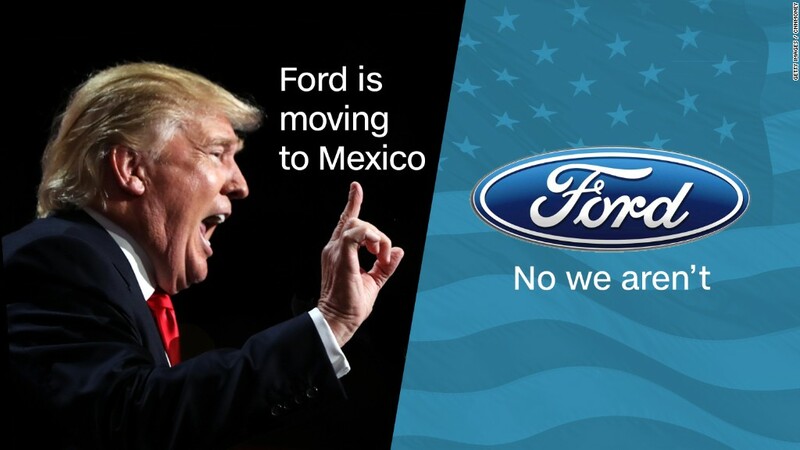 Between January and August, Ford shipped 265,000 cars from Mexico to the United States, according to the Mexican Association of the Automobile Industry (AMIA). Ford shipped nearly $4 billion worth of cars in the first half of the year to the United States, according to Panjiva, a global trade analytics firm in New York. If Trump levied a 35% tariff on all those cars, Ford would have paid $1.4 billion in taxes for just the first six months. For all of 2016, that would translate to $2.8 billion. That would be more than Ford's profit in its most recent quarter. It would immediately make Ford cars more expensive for Americans. "You put tariffs up and [American] consumers are going to pay more," says Christopher Rogers, a research analyst at Panjiva. The tariff would also have huge ramifications for trade ties between the United States and Mexico, its third largest trading partner. To be clear, Trump would need Congress' approval to impose tariffs on another country. Related: Donald Trump pledges 4% economic growth. How realistic is that? "If you want to put tariffs on autos, you have to tear up NAFTA," says Rogers. "A 35% tariff is not a small tariff on a large product group. Mexico isn't going to say 'Yeah sure, whatever.'" Trump has repeatedly threatened to renegotiate or "terminate" NAFTA, the free trade deal between Canada, Mexico and America that allows Ford and others to ship cars duty-free across borders. Trump does not need Congress to scrap NAFTA but experts warn he would risk retaliation from Mexico in the form of tariffs of U.S. goods shipped to Mexico. Mexico's automobile industry has become a staple of its economy over the past two decades as American carmakers have shifted production there. A year ago, Trump talked about imposing tariffs a lot. He often talked about imposing a 35% tariff on Mexico and 45% on goods coming from China. However in recent months, he had cooled down such talk, saying he would use tariffs but didn't throw out any figures like he used to. On Thursday, he went back to his original claim of a 35% tariff and doubled down on his anti-NAFTA rhetoric. "NAFTA has destroyed our country," Trump said during a Q&A session after a speech at the Economic Club of New York. Large tariffs would mean that Americans would pay more. History has played out that way. When Ronald Reagan put a quota on the number of cars Japan could ship to the United States, American carmakers hiked up car prices by $1,000 on average, knowing they would face less foreign competition. And the tariff probably wouldn't be limited to Ford. If it were only on Ford, its cars would be more expensive than others who produce in Mexico and sell in the U.S., which include General Motors (GM), Honda (HMC), Toyota (TM) and Volkswagen (VLKAF). Ford would then stand to lose in its home market to foreign competitors. The optics of that wouldn't bode well for Trump, experts say. "Ford -- an American company -- is going to lose out to non-American companies. That's not going to go down great," argues Rogers.